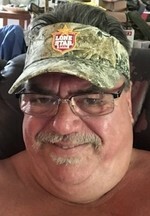 Robert (Robbie, Rob) Darrell Slezak went with our Heavenly Father, Almighty God in Las Cruces, New Mexico on February 19, 2019 at the very young age of 58. Robert is survived by his son Zachariah I. Slezak, son Joshua R. Slezak of Arizona, daughter Chelsea N. Price of Texas, and devoted girlfriend Heather Gunn Moncrief of New Mexico. He was preceded in death by his mother Martha F. King Slezak, his father Charles (Charlie) Slezak, and older brother Wayne (who he affectionately called Wayno) Slezak. Robert was born on September 4, 1960 in Houston, Texas. He graduated from South Houston High School (SSHS), in 1980, where football was his passion. He was a tall, handsome, brawny man with a heart of gold. He was elated with joy in making people smile and laugh. He prided himself with his brute strength and often, his mischievousness. Robert’s steadfast spirit, hunger for life, and exceptional humor will be deeply missed by everyone who knew him. Robert’s life hobbies included fishing (salt and fresh water), hunting (bow, rifle, shotgun), top fuel boat racing, hot rods, motorcycles, gunsmithing, mechanics, engineering and building. His two biggest quotes were, “I’m a Jack of all trades, and a master of most” and “There’s never any problems, only solutions”. He worked hard and played even harder. He was a devout Christian and his greatest love was the USA. Robbie, the Good Lord picked his rose to add you to his garden. Your mom greeted you with warm hugs and kisses. Your Earth-Bound family, friends, acquaintances, and extended family of South Houston High School wish you peace and joy in the next chapter of your being. May you Rest in Peace, Big Brother. Robert’s wish was to be cremated and spread, together with his dad’s ashes, over Christmas Bay in Galveston, Texas. A memorial service is being planned, to be held in South Houston at a later date. Arrangements are with Getz Funeral Home 1410 E. Bowman, Las Cruces, NM 88001. Please visit www.GetzCares.com to sign the local online guest book. To send flowers to the family of Robert D. Slezak, please visit our Heartfelt Sympathies Store.